This lamb shank recipe is cooked with veggies, red wine, and fresh herbs until the lamb just falls off the bone! Braised lamb shanks are easy to make and the perfect low and slow recipe. 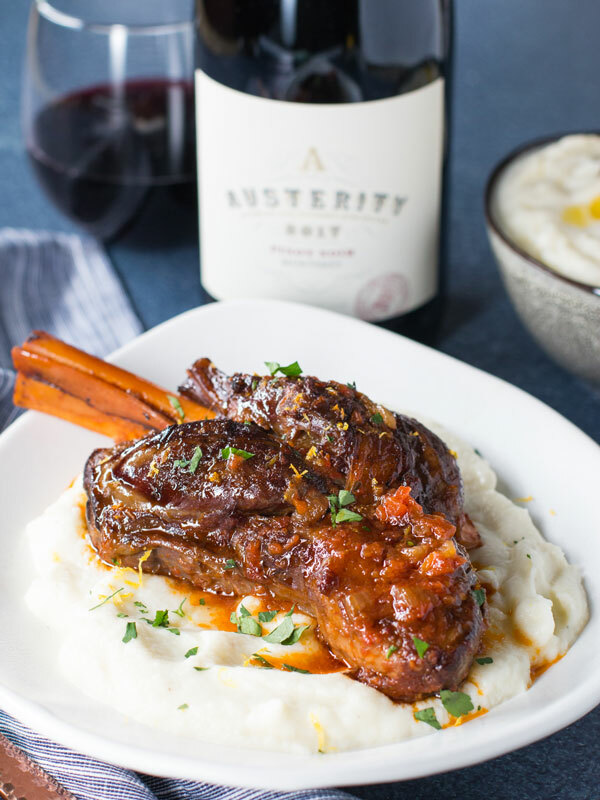 Winter is coming, and you need to start thinking about seriously tasty comfort food recipes that will keep you warm, which is why I want to share with you my braised lamb shank recipe with cheesy cauliflower mash. Just look at these photos. The lamb shanks scream comfort and the recipe is extremely easy to make. 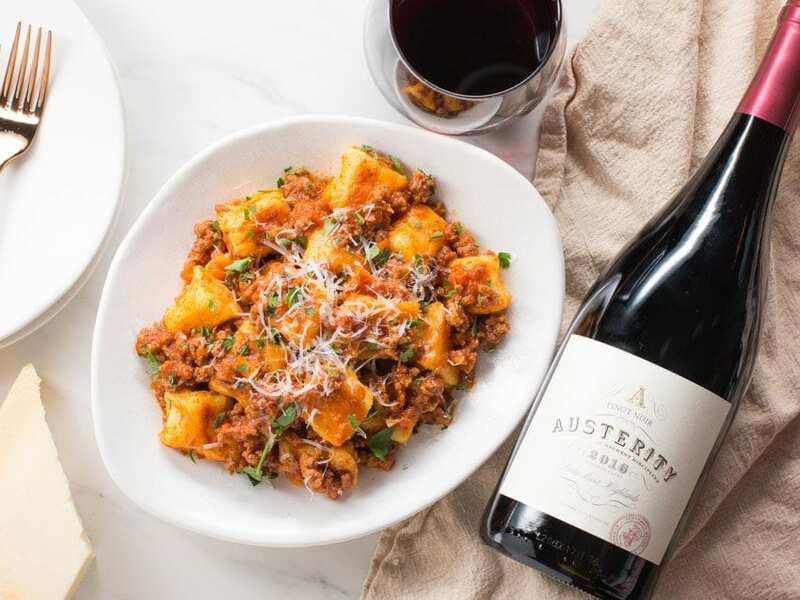 If you are looking for more comfort food recipes, check out my homemade gnocchi with red wine ragu and my Instant pot chicken pot pie. 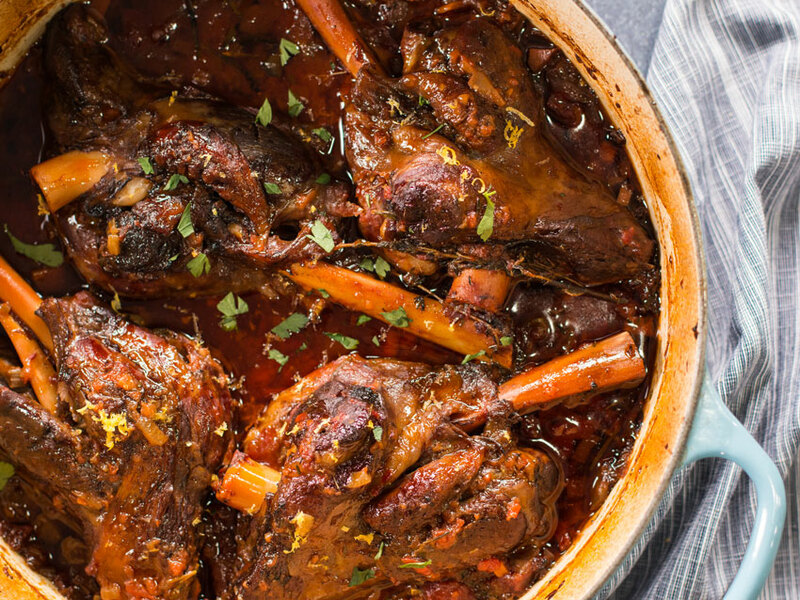 How Do I Cook Braised Lamb Shanks? To cook lamb shanks you first need to allow them to come to room temperature before searing in a hot dutch oven pot. Season the lamb shanks with a generous amount of salt and pepper all over and sear until golden and crusty on all sides for about 10 minutes. Don’t be tempted to skip this step as it adds incredible flavor. Remove the lamb shanks in from the pot and cook the veggies and fresh herbs for 15 minutes until they really wilt down. Don’t rush this process. Next for the lamb shank recipe. Add some tomato paste and some of the Austerity Pinot Noir to the pot and cook until most of the wine has reduced. Add the lamb shanks back to the pot along with crushed tomatoes and beef stock or water, slap a lid on the pot, and transfer to a 325 degree F oven for 3 hours, flipping the lamb shanks half way. 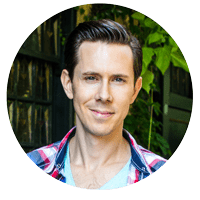 While the lamb is cooking, you can make the cheesy cauliflower mash – it is a great low carb alternative to mashed potatoes and so easy to make. Just boil the cauliflower and garlic and toss it in the blender with a generous amount of cheese and a big nob of butter. Blend away until smooth and creamy – such a winner of a side dish. 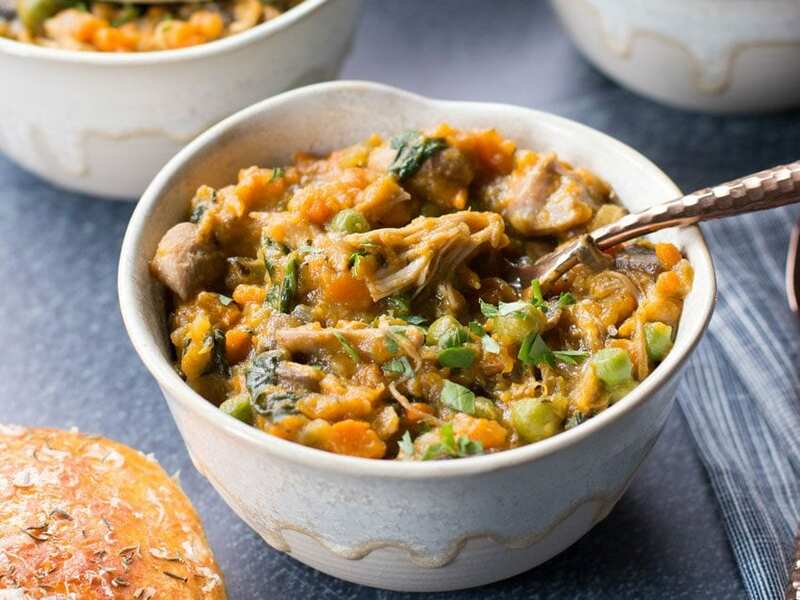 How Do I Cook Lamb Shanks In A Slow Cooker? To cook lamb shanks in a slow cooker, follow the exact steps listed in this recipe and set the slow cooker on low for 8 hours. You can either brown the lamb shanks and cook the veggie in a separate pan or you can just dump everything in the slow cooker and press go! 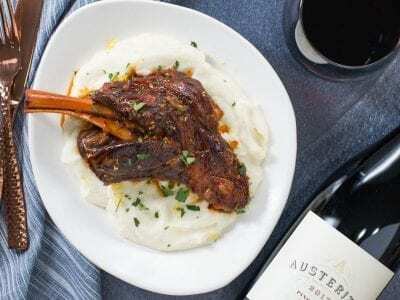 This low and slow braised lamb shank recipe is comfort food done right. Lamb shanks braised in red wine and veggies for 3 hours until falling off the bone tender. The best way to cook lamb shanks. Allow the lamb shanks to sit at room temperature for 20 minutes before cooking. Pre-heat oven to 325 F and pre-heat a large dutch oven over medium-high heat with 2 tablespoons of oil. Season the lamb shanks with a generous pinch of salt and pepper all around, and place in the pot. You may have to work in two batches as you don’t want to overcrowd the pot. Cook for 5 minutes, undisturbed, or until the lamb is well browned, flip and repeat. Repeat with second batch and move lamb shanks aside. Turn the heat down to medium and add the onions, celery, carrots, thyme, rosemary, ½ teaspoon salt, and a few cracks of pepper. Cook for 10 minutes and then add the garlic, and cook until the veggies are very soft, about 5-8 minutes more. 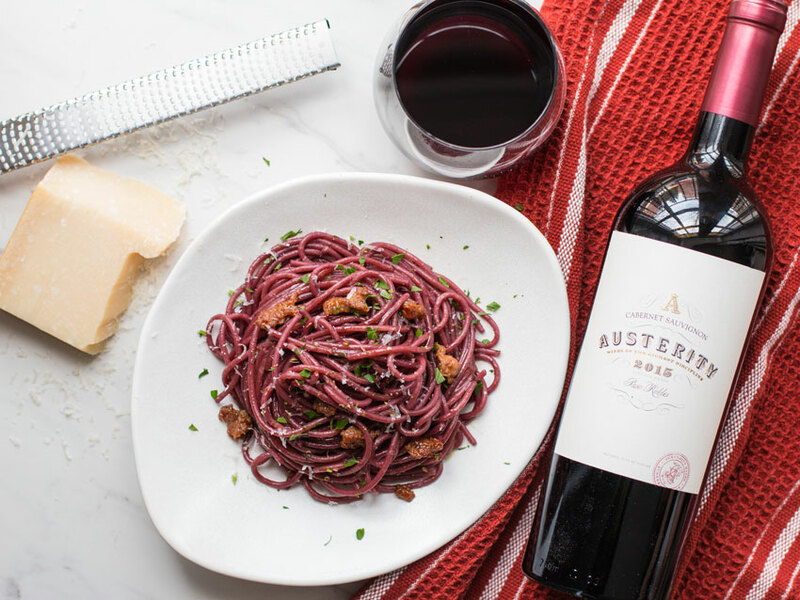 Add the tomato paste and cook for two minutes, then add the Austerity Pinot Noir. Cook for 3 minutes, or until most of the wine has evaporated then add the lamb shanks back to the pot, the tomatoes, and enough stock/water to come just above halfway of the lamb shanks. Add another ½ teaspoon of salt, a few cracks of pepper, and move everything around so the cooking liquid is mixed. 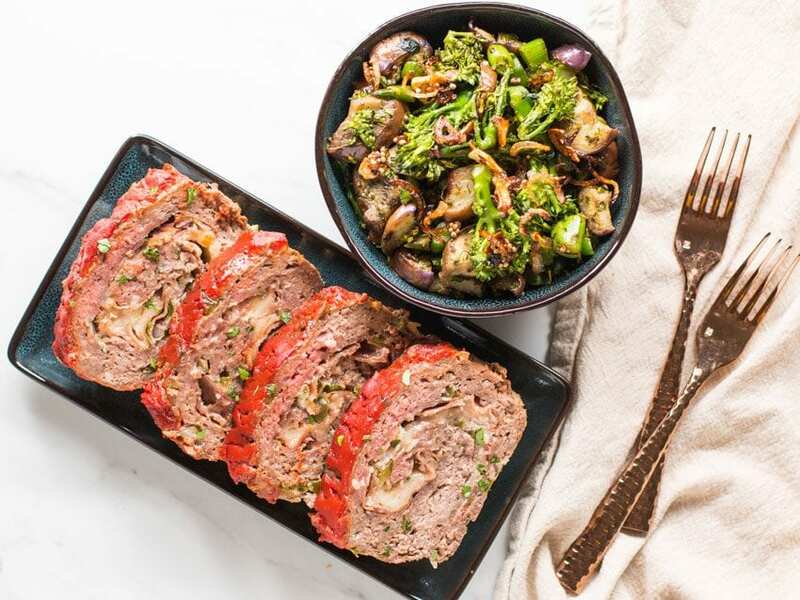 Place a lid on the pot and cook in the oven for 1.5 hours, flip the lamb shanks, and cook another 1.5 hours. Remove from oven and allow to rest with the lid on for 20 minutes before serving. You know the lamb is ready when it pulls apart easily with a fork. While the lamb shanks are cooking, make the cauliflower mash by bringing a later pot of water to the boil and cutting the cauliflower into large bite size florets. Season the boiling water with 2 teaspoons of salt and boil the cauliflower florets along with the garlic for 7-10 minutes, or until you can mash the cauliflower with a fork. Make sure not to over-boil the cauliflower, as it will get too watery and ruin the mash. Save 1 cup of the boiling water, strain the cauliflower and garlic, and place in a blender. Add a ¼ cup of grated cheese, 1 tablespoon of butter, ¼ teaspoon of salt, and a few cracks of pepper to the blender with the cauliflower. Blend until smooth and creamy, using a plunging stick to help blend the cauliflower. If the mash is too thick, add just a bit of water. Blend well until smooth and creamy and check for seasoning, you may need more salt. 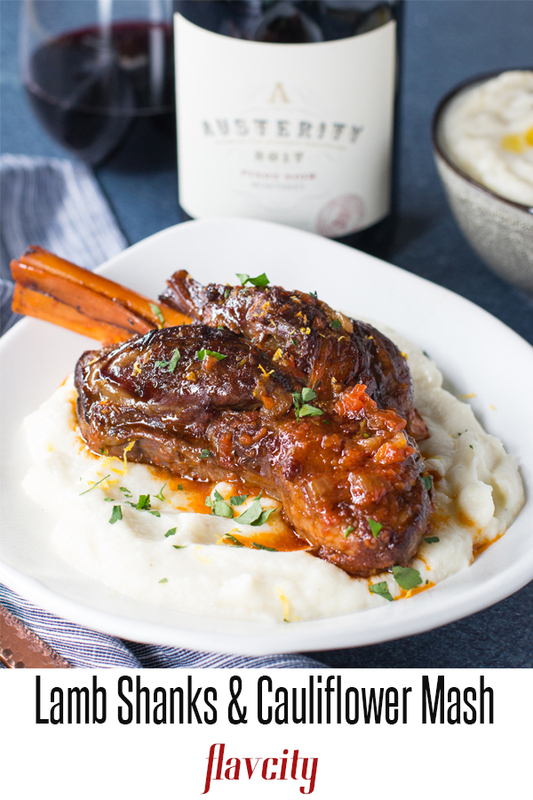 Serve the lamb shanks with the cauliflower mash and enjoy!